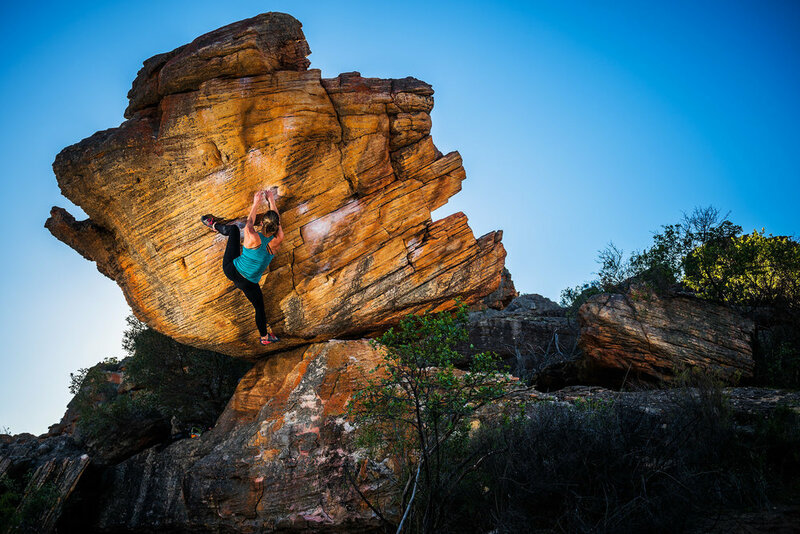 19-year-old professional climber Imogen Horrocks, the former British Bouldering Champion (a title achieved at only 14 years old) is palpably excited when telling me about her recent expedition to The Rocklands, South Africa. 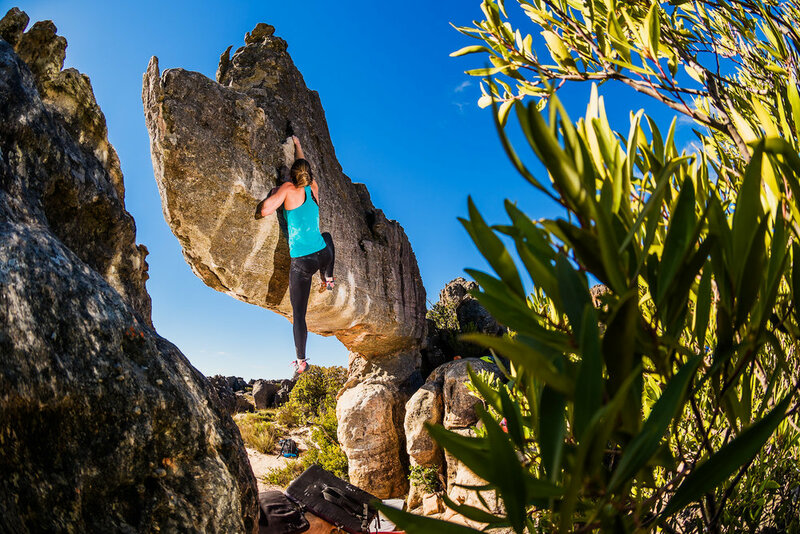 Accompanied by her coach Robin O’Leary, Imogen made the trip to South Africa with the goal of topping her highest-grade bouldering route to date and by doing so establishing herself as a real force in the sport. The Rocklands is an iconic bouldering location, famed for its endless rock formations that stretch as far as the eye can see. Whilst the trip was filled with many accomplishments, Imogen had her eyes set on ‘The Hatchling’ named after its broken egg shell like appearance. At 19 years old, this was no easy feat for Imogen and working alongside Robin over the course of a few days she would eventually pull all the pieces of the puzzle together and make the grade. Accomplishing her first V11/8a grade climb is a mile stone in her career as a climber but it is just the start for this incredibly talented young athlete from the UK. “I got quite frustrated. it took about 3 sessions to do it, I was hoping to get it done a little bit quicker”. Anyone who has attempted any of the climbing disciplines themselves has a semblance of knowing the amazing challenges this exciting sport provides. With success in climbs and competitions balanced often on the straining sinews of millimetres of finger tips and toes, Imogen explains that the greatest reward for her climbing is “the feeling of getting to the top of a really hard problem, or a hard move… when you’ve done them, not necessarily in a comp (competition), but just the feeling of doing a problem that was really hard or really cool, it feels really good”. As a team GB athlete adding World Cup competitions to her name, Imogen begins that her key goals for climbing are to “make a World Cup semi (final) and hopefully a final, and my outside dream is to do 8b or slash 8b” (considerably harder than her The Hatchling achievement). As well as popping up on popular TV shows like Ninja Warrior, Imogen’s athletic prowess clearly capturing the minds of TV producers, The Rocklands climb is clearly a great achievement for Imogen. Laughing as she tells me that when she finally made the climb, she and coach Robin “were both pretty psyched, I went out and treated myself to some pudding!’. With climbing becoming increasingly popular, with climbing facilities, training camps and high-profile athletes gaining notoriety worldwide, Alex Honnold’s recent free-solo (rope free) ascent of El Capitan in Yosemite being named by many as arguably the greatest athletic feat by a human being ever, climbing’s trajectory and popularity is clearly on the rise. With Imogen diversifying her options as a climber, I ask her, with climbing now included into the next Olympics in Tokyo Japan, if that is a goal of hers? Citing American professional climber Kyra Condie as one of her greatest inspirations, I ask Imogen how she feels about potentially being inspiration for younger girls herself now? “I hope to inspire younger children, or girls in general and guys” she admits. With a career trajectory already on an impressive incline, it’s clear Imogen Horrocks is firmly on the ascent. *The format for the first climbing competition in the Olympics is that the athletes must participate in 3 seperate climbing disciplines, speed climbing, bouldering and lead climbing. At the Games, each climber will compete in all three disciplines, with the final rankings being determined by the combined results. Check out Imogen sending The Hatchling below!